A blog on restaurants, travel & all things nice! Crockers Folly in St John’s Wood was a thriving pub in its former life. Built in 1898, the beautiful Grade II* listed building fell into disrepair and was closed in 2004. But in 2014 The Maroush Group took ownership of Crocker’s Folly and lovingly restored it. Crocker’s Folly now speaks of grandeur, but with a relaxed and inviting tone. The revitalised Crocker’s Folly is divided into three sections – two separate bars and a dining room. It has been beautifully refurbished with bespoke features such as dazzling chandeliers, mahogany woodwork, the use of at least 50 kinds of marble and some gorgeous imported Italian furniture. I visited Crocker’s Folly last year but that was only for the Sunday set menu. This time around I had the opportunity to try the a la carte menu, starting with the roasted octopus (£12) which was divinely tender and nicely cooked. It was served with a pappa al pomodoro sauce, a rich, intense concoction rich with tomato flavour. Crocker’s Folly in St John’s Wood was a thriving pub in its former life. Built in 1898, the beautiful Grade II* listed building fell into disrepair and sadly closed in 2004. By 2007 Crocker’s Folly had been placed on the Victorian Society’s list of top ten endangered buildings. In 2014 The Maroush Group took ownership of Crocker’s Folly and lovingly restored it back to its former glory. Thus Crocker’s Folly was reborn, re-opening after a long ten-year absence. Many of the original aspects of the building have been maintained along with the addition of some beautiful bespoke features such as dazzling chandeliers, mahogany woodwork and the use of at least 50 kinds of marble. It’s a glorious restoration and beautifully done, with the finishing touches being some gorgeous imported Italian furniture. Crocker’s Folly now speaks of grandeur, but also with a relaxed and inviting tone. Crocker’s Folly is divided into three sections – two separate bars and a dining room. Heading up the kitchen is Head Chef Arek Bober who previously worked under Jason Atherton at Pollen Street Social. His Crocker’s Folly menu is modern European with a section specifically devoted to steaks cooked on the josper grill. 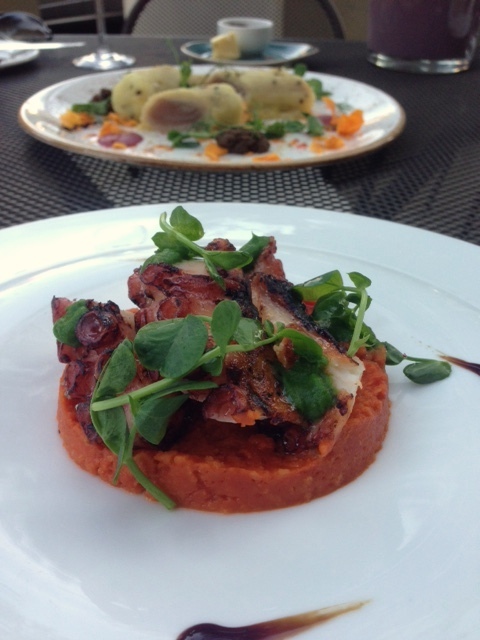 On a Sunday, Crocker’s Folly offers a special set lunch menu with two-courses for £20 and three-courses for £25. It is also possible to order each dish individually and the prices listed below are the price per dish. 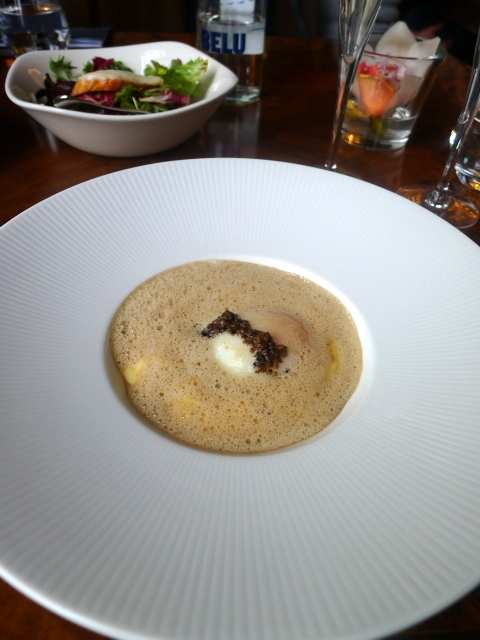 We started our lunch with a 62c egg with soft polenta (£10) which was delicious. The egg, slow cooked at 62c was soft-set in the centre with a beautifully golden yolk and it married well with the creaminess of the soft polenta. Completing the dish was a topping of lovely fresh truffle shavings, Parmesan cheese and a mushroom emulsion that added a nutty, earthy flavour to the combination. On a recent weekend trip to West Sussex we stopped off for a meal at The White Hart, a charming country pub in the cozy village of Harting. The White Hart represents the essence of a quintessential English pub. It was full of warmth and character with a lovely spacious beer garden. It was sunny when we went and we got the chance to enjoy a drink outside before our meal. The White Hart is located near the A3 and is within driving distance to Uppark, a National Trust property where H.G. Wells spent time when he was a young man. 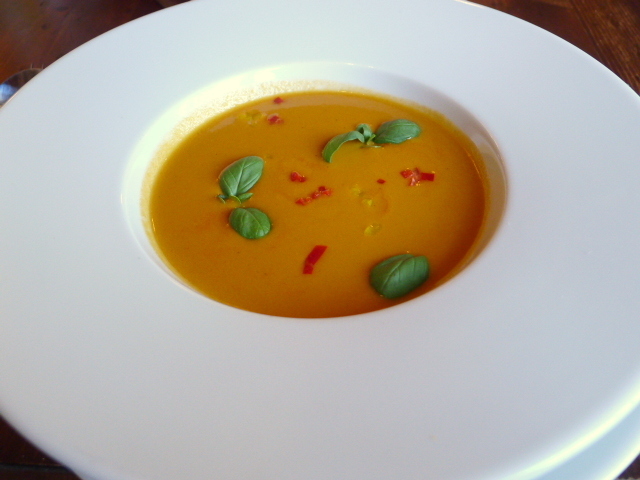 We tried several starters and our favourite was the delicious chilled tomato gazpacho with peppers and basil (£5.50). It was beautifully creamy and sweet from the freshness of the tomatoes and with just the right level of consistency. The use of peppers added a pert contrast, and some fragrant basil created a lovely perfume over the dish. 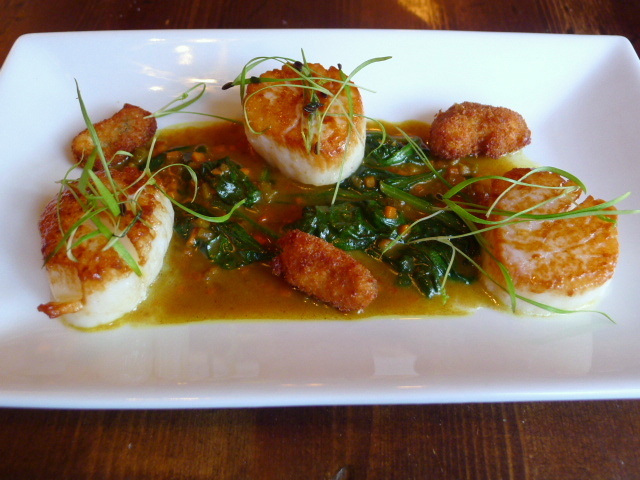 Pan seared scallops with mussel fritters and curry (£9.50) was also tasty. The scallops were plump and juicy and nicely cooked if a little salty. The curry sauce was decent but a little overpowering against the delicate scallops. There was also some mango in the dish that provided a pleasant counterpoint with its sweetness and the mussels were lovely and crispy. A piece of seared foie gras (£8.50) was also enjoyable, being nicely cooked and firm in texture. 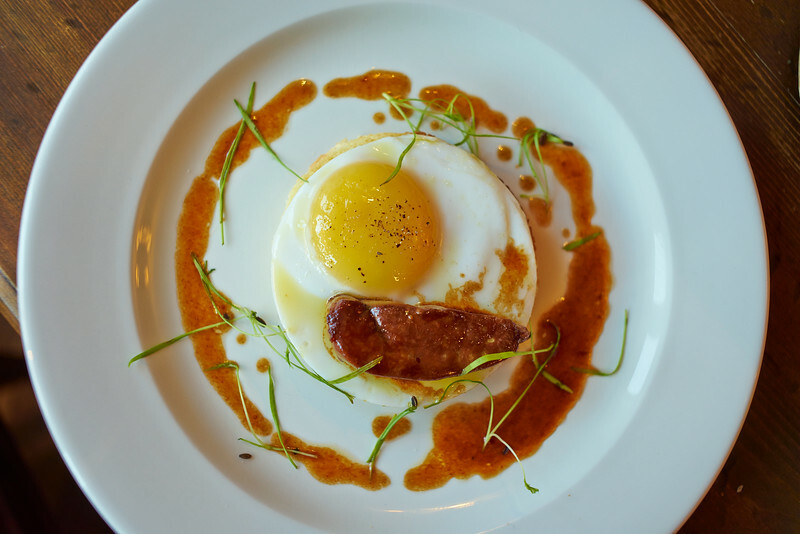 A fried duck egg with a rich runny yolk accompanied the foie gras and was perched on top of a slice of light and airy brioche. To the mains, and a lamb rump was full of flavour and very tender. Accompaniments included a delicious smoked aubergine puree and some goat’s curd that added a delightful touch to the dish since the heat of the meat gently melted the curd, thereby creating a creamy effect. There was also a side of Mediterranean vegetables which were well cooked but were a touch over seasoned. A 10oz Rib eye steak (£24.95) was tasty but a little chewy in parts. 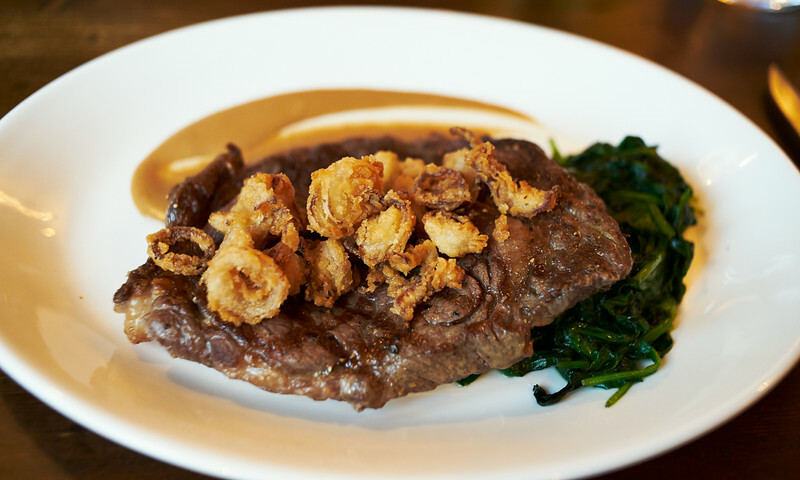 Alongside the steak was some sautéed spinach, hand cut chips, shallot rings and a wonderfully smooth and smoky onion puree. 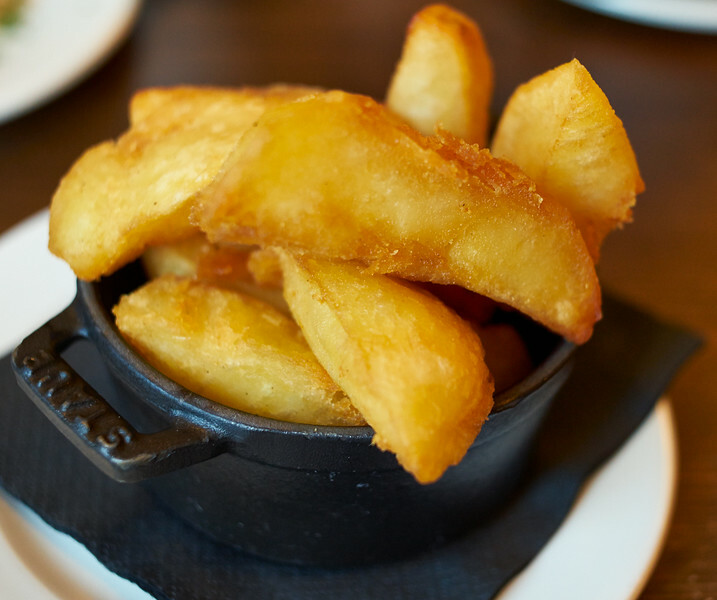 The hand cut chips were excellent with a crunchy exterior and a soft centre. The desserts were also really enjoyable. 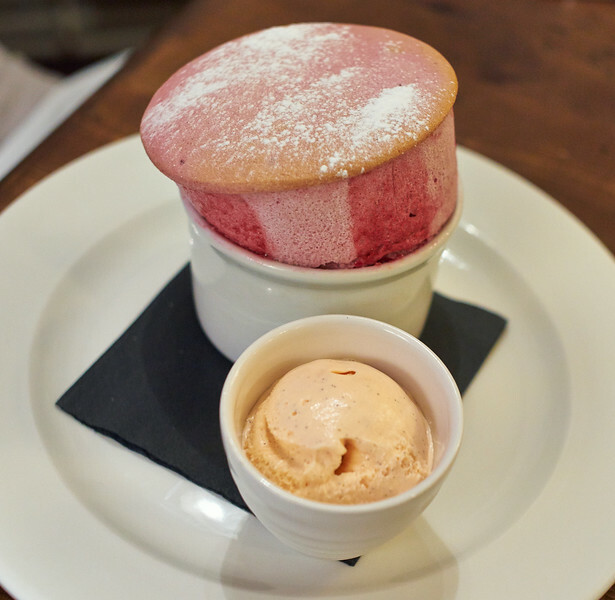 A raspberry soufflé was a little lopsided but it was otherwise well made with a delightful airy texture. It was a little sweet however but this was tempered by the accompanying rose ice cream which was yummy and aromatic and which worked wonderfully with the soufflé. Scoops of baileys and honey and lavender ice cream (£1.50 per scoop) were appetising. We really enjoyed our visit to The White Hart. The seasoning needed some tweaking in parts, but otherwise the menu was well thought out and the cooking showed some off some solid skills. The service was friendly and welcoming but needed to be more attentive in parts. That said we really enjoyed dining at The White Hart. 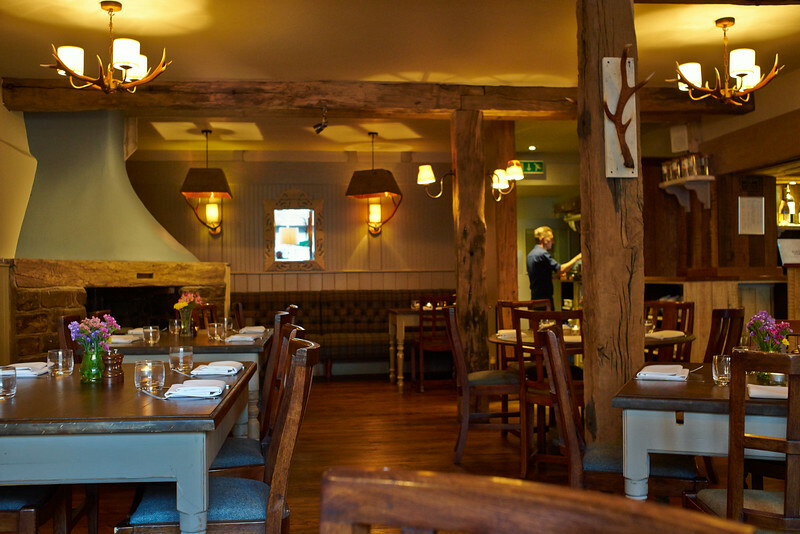 The cooking was solid and smartly executed, and the cozy country setting makes The White Hart a charming find. Prices: £24 to £43 for three courses, excludes drinks and service. The White Swan, located on Fetter Lane near Chancery Lane, is an old-fashioned boozer which has long enticed the city crowd with its fine selection of ales and refined gentile feel. But it also serves as a gastropub, with the first floor area being transformed into a smart but not overly fussy dining room styled with an art-deco touch. 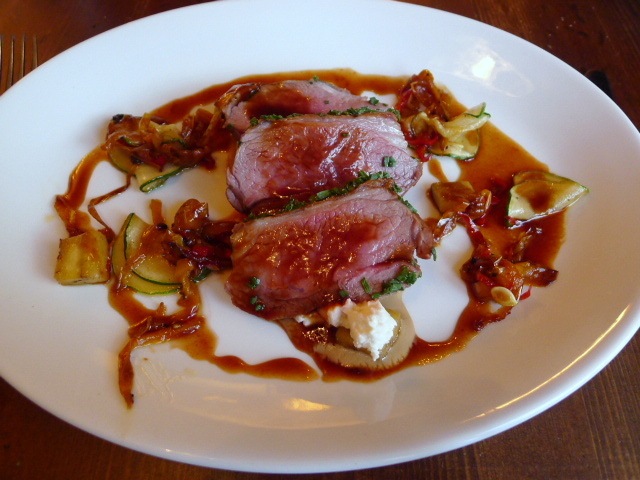 The food is also classically British and smartly done, teetering on high-end without being too over the top. The ground floor pub also serves food, and although its menu includes a burger and fish and chips as options, the other items are rather smart with the likes of dishes such as confit duck leg and slow roasted pork belly. Migrate upstairs to the main dining room, and the a la carte menu becomes more creative with the added option of a tasting menu. 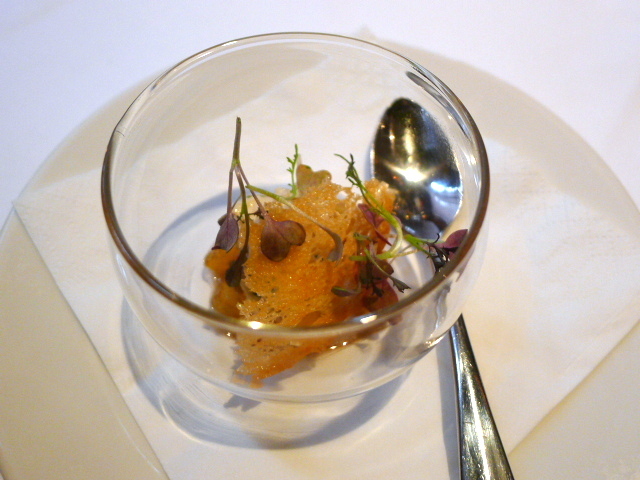 We decided to go for the tasting menu, which was a rather reasonable £55 for six courses. Our amuse bouche was a crab salad with cucumber and tomato which was lovely and fresh and blended with a creamy mayo that tasted distinctively homemade. The Only Running Footman is a wonderfully quaint pub/gastropub whose name pays homage to the footmen who were in service to the households of Mayfair in Georgian times. The role of the footman included such tasks as carrying lights after dusk, paying toll-keepers and generally paving the way for safe passage for his aristocratic master’s carriage. It was here at The Only Running Footman, known as The Running Horse during those times, where the footmen congregated for drinks after their duties. The pub’s full name is actually ‘I Am The Only Running Footman’ and has been the venue for many a pub crawl, mystery tour, etc. Most notably it served as the inspiration for a novel of the same name by detective fiction writer Martha Grimes. The ground floor acts as the pub proper with the first floor holding the dining room. It’s a small space, but it is nevertheless plush and cozy with its inviting leather banquettes. The look of The Only Running Footman is smart, and the food is equally smart and more refined than might be found at the average gastropub. 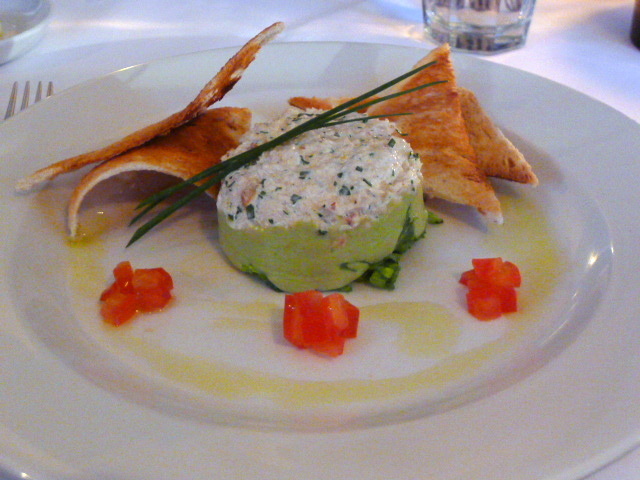 We started with a tian of fresh Cromer crab with avocado and melba toast (£11.50). There was a decent amount of crab meat which was deliciously sweet and fresh. The avocado purée worked as a nice accompaniment to the crab. It was beautifully smooth but we wanted for a slightly richer, deeper avocado flavour. Marquess Tavern is a cozy local pub located on Canonbury Street in Islington. The main focal point of the pub is the central bar, and circling the bar are tables where customers can sit and enjoy a drink or have a bite to eat. Marquess Tavern won the Time Out Gastro Pub of the Year award in 2006, however the current layout of the pub (where there is no dedicated separate dining area) suggests that Marquess Tavern’s focus has shifted from gastropub to boozer. 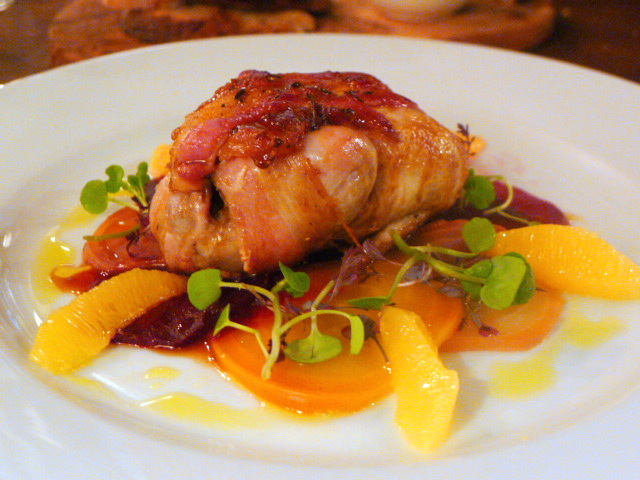 We tried the quail wrapped in smoked bacon (£7.25) with beetroot and orange. It was a pleasant dish with the quail being tasty and moist. But there was no caramelisation on the quail and it needed more browning on the skin for greater flavour and a more superior finish. Great Queen Street is owned by the same group that also own Anchor and Hope, a gastropub which has carved a name for itself with its inventive British cooking and its use of head-to-tail ingredients. Great Queen Street’s menu plays less reliance on offal cooking, but it is similarly classically British. Its makes good use of seasonal ingredients, and as such the menu is ever changing. Great Queen Street is a rustic looking venue – the furniture is dark, and the lighting is kept low. Located on Great Queen Street in Covent Garden, it’s a perfect spot for a bout of casual central London dining. 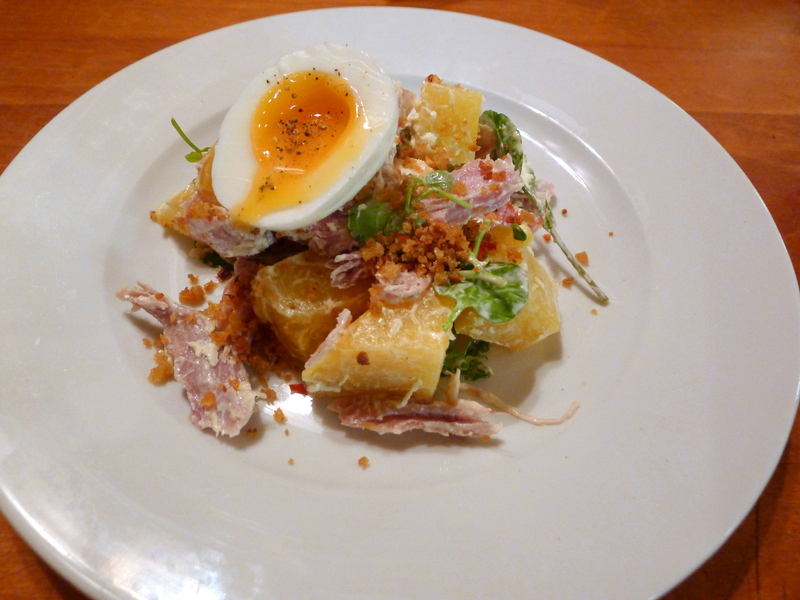 A starter salad of ham, egg, beetroot and horseradish (£7) was absolutely scrumptious. There was something heavenly about how the salty crispy ham blended with the earthy sweetness of the well-cooked beetroot. A half soft-boiled egg was perfectly cooked, and the horseradish dressing gave the salad a lovely kick. This was a wonderful marriage of flavours, all of which combined beautifully together. This past Wednesday I attended the ETM bloggers bar crawl which was super, super fun. Blogger friends who came along included Greedy Diva, LondonFoodie, WineSleuth, Missimmo, Teatimeinwonderland and Faerietalefoody. ETM operate a number of gastropubs in London and we hopped along from one ETM bar after another, sampling food and drinks (listed at the bottom of this post) along the way. First up was the lovely, elegant Chiswell Street Dining Rooms where we tried a number of canapés such as seared Isle of Man king scallop with crispy bacon and pea purée; smoked eel with horseradish; foie gras ballotine on brioche with Madeira jelly; leek and wild mushroom tart and soft boiled quail’s egg with truffled duxelle. Particularly delicious was the mini Aberdeen Angus beef Wellington as the meat was plump and juicy. 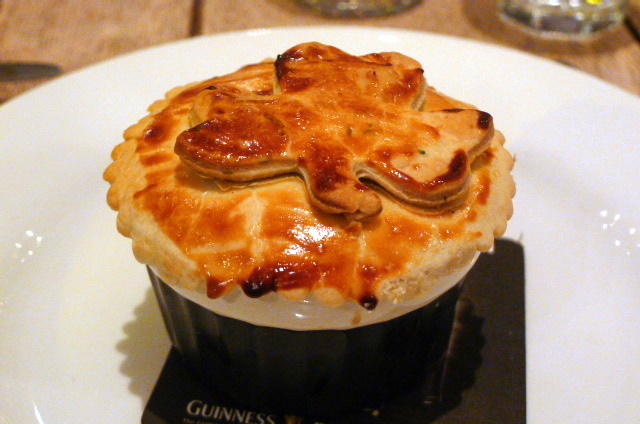 At The Hat and Tun we had a starter of Herefordshire snail & smoked bacon pie with a Guinness and mushroom cream sauce. The snails were nice, but the sauce was very runny, and both the filling and the pastry needed more seasoning. Or click here for more ways to access my feed. A Girl has to Eat – (and travel) Restaurant and travel reviews is subject to copyright © 2011 - 2013 (All rights reserved).